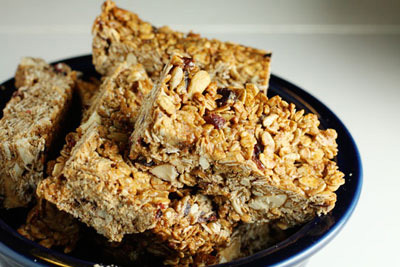 While delicious, the only sweetness in these homemade snack bars comes from the dried fruit. Add a small amount of honey or brown sugar if you like! 2. Mix all dry ingredients. 3. Mix all wet ingredients. 4. Pour wet ingredients into dry ingredients. Stir to combine. 6. Bake for 40 minutes. 7. Cut into 8-10 squares. This recipe makes 9 servings . Each bar is appx. 170 calories, 3 grams fiber and 5 grams of protein. You can wrap each bar in plastic wrap and place them in ziplock bags in your freezer. When ready to eat, just grab and go, or pop them in the microwave for instant enjoyment!